Finding a good thermometer for outdoor grilling and smoking has proved to be quite a challenge. Over the years I've tried thermometers ranging from cheap pocket models (forever to get a reading and often not accurate) to a deluxe probe model with an indoor alarm (a bear to program and again not particularly accurate). 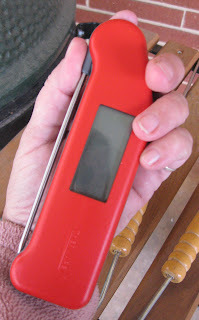 Some of my barbecue friends had been buzzing about Thermapen, but I'd not had a chance to see or use one. I was toying with the idea of springing for yet another thermometer when Jesse got in touch to see if I'd like to test drive one and share my thoughts. I did a little more research, and this sounded like a thermometer that might work here in the land of multiple grills and chronic smoking. Jimmy was drafted to smoke a turkey that my step-dad won at the turkey shoot, and I hooked him up with the brand new red Thermapen. The colors on these thermometers are just terrific. They even have a pink one, but my guys aren't so keen when I start snagging pink stuff. They can't wander off with my pink gear (or not so easily). This was Jimmy's first turkey on the Big Green Egg. He whipped up a nice brine and let the bird rest overnight and then put it on before I got out of bed. He's the early bird, and I'm a night owl. This works out well for smoking but not so much for movies. 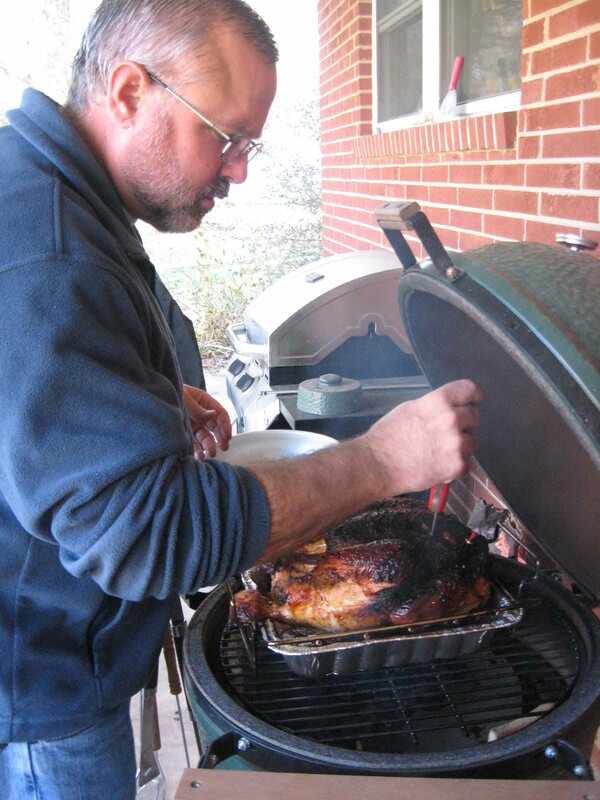 The Big Green Egg is a lid-closed outdoor cooker - convection but with more moisture and with the smoke of course. Opening the lid drops the temperature, so the fast read on the Thermapen was terrific. It only took three or four seconds to get an accurate reading, so it was a fast in and out when the turkey was getting close to done. Eyeballing a large cut like a turkey or pork shoulder is one sure way to get undercooked meat or dried out sawdust. You can see here that the turkey looks like it could come off. The head room in the Big Green Egg is not huge and with the natural sugars in the brine, the bird browns up really fast. We were several degrees out from a fully smoked turkey at this point. Jimmy finished smoking off the turkey while I mashed up some potatoes and made gravy, and then we headed over to Mom's house for a big family dinner. Everyone loved the turkey. It was spot on, since the Thermapen made it easy to check the temperature. I'm really impressed with the Thermapen. It's super easy to use. You just snap the probe out, and the reading comes on. Then you wash and close it to turn it off. The reading is really fast, and the numbers are large enough to see. My vision is not as good as it used to be, so it's a blessing to be able to easily read a thermometer. Likewise, the battery compartment is big enough to easily open and replace batteries. I hate items that are so scaled down that I need a magnifying glass and tweezers to try to work on them. On the flip side, Thermapen is compact and easily fits in my hand or pocket. I have one set that is really big and has wires and probes, and I have to box it up to keep the thermometer set together. I'm not thrilled about the cabinet real estate that one takes up, so I'm a lot happier with the Thermapen which fits right in my kitchen catch all drawer. The price of the Thermapen would be the only ouch. But, if you wreck a few steaks or a couple of briskets, then you'll find this investment well worth the money. You're getting a custom hand made product out of England that is top quality and accurate. Thermapen has, as an added bonus, the cool factor with the nice design and great colors. After using the Termapen, I'm sold. I'd also note that Termapen is not just for outdoor grilling and smoking. It's also popular with the kitchen crowd. My next project will be making some homemade candy. I've been using the cold water ball trick which is not always a winner. Thanks for this great review. I hope these guys send you all of their new products! Love my Thermapen, works like a champ. 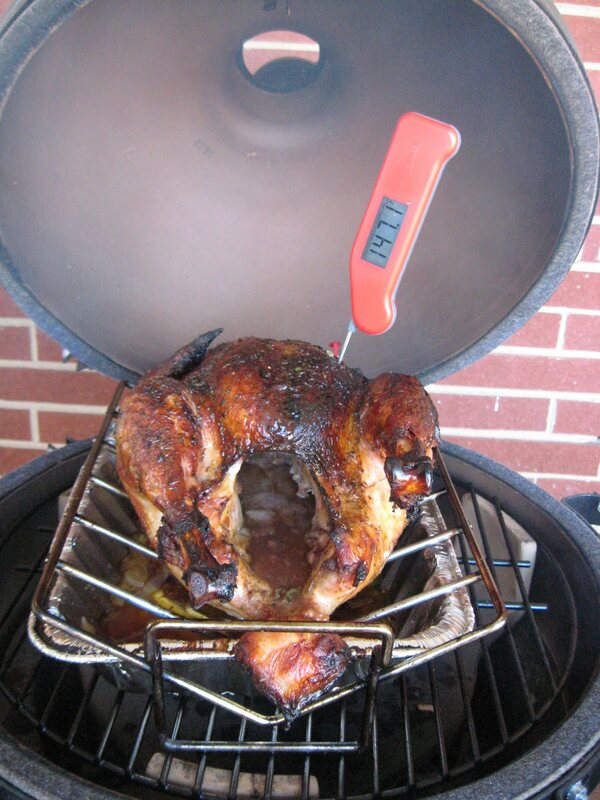 I've been looking for the perfect grill thermometer for a while, and this one looks pretty cool. Might have to pick one up if the price is right. 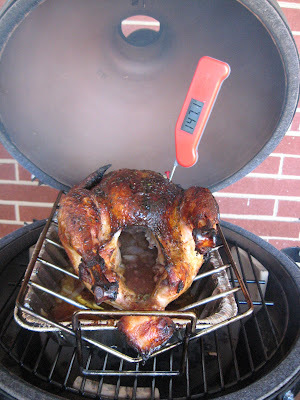 A good kitchen and bbq thermometer is a great investment for your kitchen and bbq. It really simplifies your roasting and bbq. No more guessing.